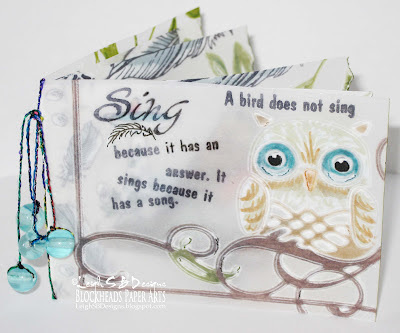 Velvet Paw Creations: "Bird Song" Mini Vellum Book & Blockheads Paper Arts new Mini Book Challenge! 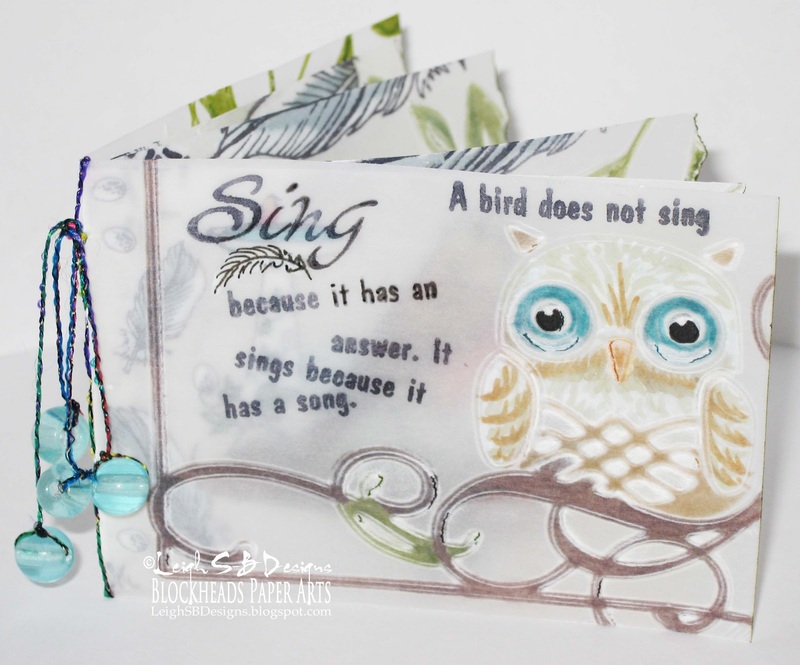 "Bird Song" Mini Vellum Book & Blockheads Paper Arts new Mini Book Challenge! 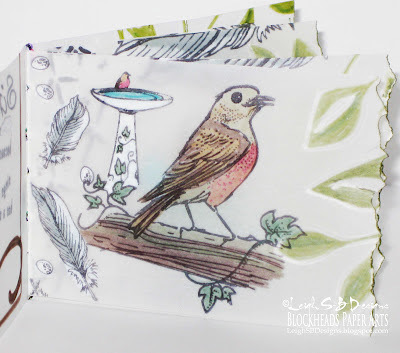 It's new challenge time again over at Blockheads Paper Arts and this time Trisha has demoed how to do 2 very easy mini book binding techniques! Here's my take on the Mini Book Challenge. 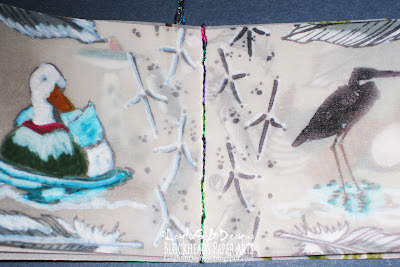 I created a really cute mini book made out of vellum using a combination of stamped images coloured with water-based markers and embossing folders! 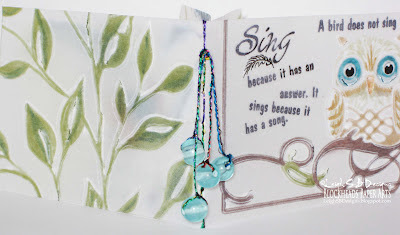 This really is a super fun and super easy mini book to make! 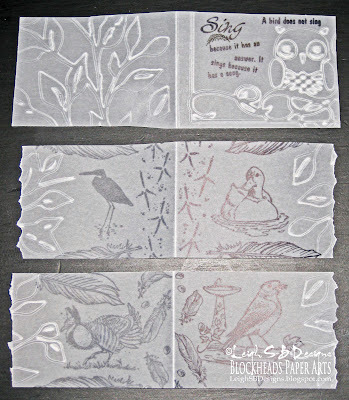 I used images from Blockheads' Frogs and Birds stamp set and two Cuttlebug embossing folders to decorate my pages: Owl Flourish and Leafy Branches. Cut a 3 narrow strips from vellum approx 2.25 x 6.75 inches but make one of them just slightly larger than the other 2. That one will be the cover for the book. The other 2 are the pages for the book. Tear the edges on on both pieces. 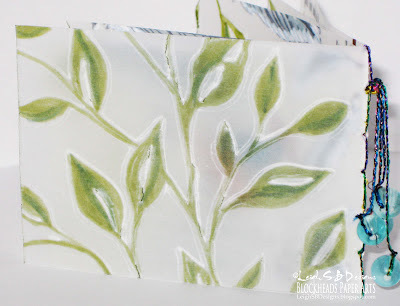 Fold all the strips in half and emboss the edges of the pages and the back cover of the book with Cuttlebug's A2 Leafy Branch embossing folder. 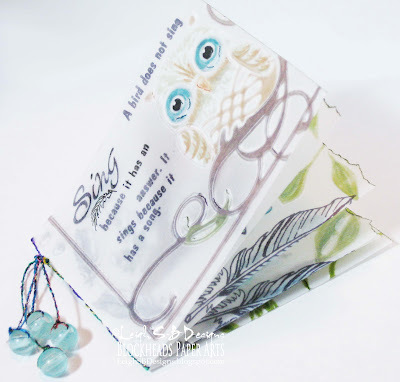 I REALLY wish I'd had the EF called Bird Call, that would have fit in to my theme just nicely, but I have the A2 Owl Flourish in my stash and used that one on the cover of my book. Tip: Emboss the back cover first and then the front because running the strip through the embossing machine the second time tends to flatten the previously embossed design and you want the cover to be the most embossed! 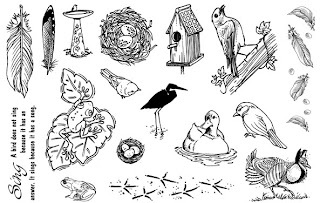 Stamp all the pages with various images of birds and set the ink with a brief zap of the heat tool just so you can continue working immediately. The Archival Ink does dry pretty quickly anyway but I wanted to do all the other stamping on each page without smudging anything. 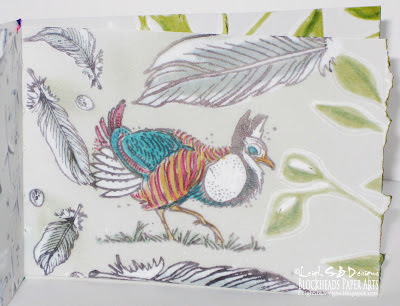 Using water-based markers on vellum is a really fun technique to do. You don't have to be super careful with the colouring and avoiding going over the stamped lines because you actually do all colouring on the back of the sheet! The result is this wonderful muted stained glass-like effect. I also coloured in all the embossed areas too! I used a combination of Marvy Le Plume II brush markers with Distress Markers to colour all my pages. The Marvy Le Plume II are vivid dye-based colours and you can see how bright the coloured sides actually are in the photo of the pages all fanned out. The colours I used are all from the Victorian Set. I also used the following Distress Markers: Tea Dye, Peeled Paint, Weathered Wood, Fired Brick and Old Paper PLUS my new favourite...the white Picket Fence marker! Picket Fence looks fantastic on vellum and I discovered you can blend with it...oh yeah, now we're talking!! 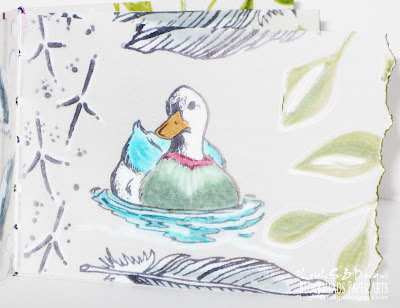 I blended it mainly with the Teal marker on the water sections, the Teal and Green sections on the duck and the Weathered Wood Distress marker on the feathers. LOVE it!! Apply dark Green marker to all the torn pages to emphasis the distressed edges. 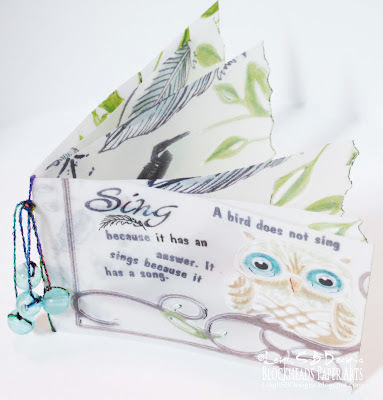 Assemble all the pages together with the book cover and clamp them together to hold them still while you punch the holes through the spine with a sharp pointy tool like a pick used for picking out the pieces in intricate die cuts or a large pointy needle will do the trick too. I decided to stitch the whole spine so instead of just 2 holes I did 5 at 1/4 inch intervals. The photo above shows the stitching in the middle of the book. Start by threading metallic variegated fiber through the top hole from the outside in and leave a tail about 2 inches long. For the first stitch, go up over the top edge of the mini book and back through the same hole. Continue stitching all the way down and repeat the same step at the bottom edge. Continue stitching all the way back up again and finish with another 2 inch tail at the first hole. Knot the two ends together and attach another length of fiber to the same spot and knot them all together to form a tassel. The glass beads I used have large holes so instead of trying to make a huge knot on the end to keep the bead on the fiber I just threaded it through and tied the knot on the outside of the bead. Not sure if I'm explaining that very well but you can kind of see it in the photos. The fiber loops over the one side of the bead instead of being invisible with a big knot on the end. Add a dab of Judikins Diamond Glaze to the knot to secure it and then trim off the excess. The only 'on the front' colouring I did was the black on the owl's eyes coz it wasn't dark enough coloured on the back. I used Black Soot Distress Marker and also added a highlight dot of Marvy Le Plume Opaque White marker to each eye to make them pop. I hope I've inspired you to make some fun mini books! So are you up for the Blockheads' Mini Book Challenge? This is a beautiful mini book. I love the owl. Thank you for joining us at Inky Impressions this week. Good luck and I hope you will join us again soon. 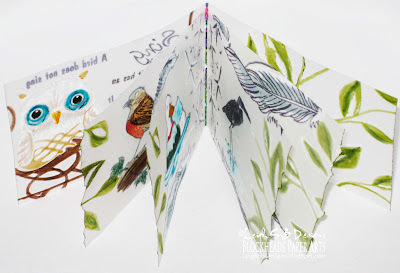 Very sweet little mini book, thankyou for sharing it with us at Fab'n'Funky this week. So glad you found the Art Impressions Challenge Blog! Your book is so creative! I never think to pull my velumn out and you did such a wonderful job with it. Thanks for joining us this week at Art Impressions. Hope we see you again soon. Love this!! 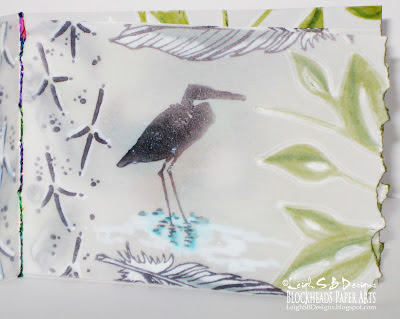 I love how the dry embossing and the markers look on the velum!! Must try. I have that owl folder too!! Wonderful mini book, love the owl! Leigh this is stunning! I love the look of the colors on the vellum. 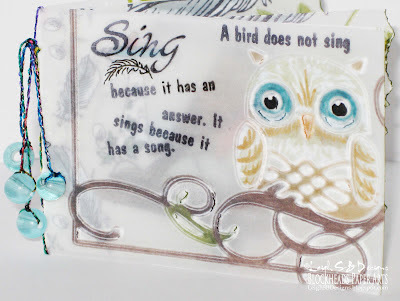 Love the stamps you chose as it is the perfect theme for vellum...I have to give this a try. Thanx so much for sharing I really love it! Beautiful Mini book. Thanks for joining us at Inky Impressions. Oh, this is so neat, Leigh! I haven't used any vellum in probably a year but your creation here sure gives me some inspiration! I just love this! Wow!!! Your book is gorgeous. Love your stuff as always, Leigh!! miss you guys!